Architecture Metals provides an entire line of products for commercial property flood protection. All of our solutions are engineered to provide extreme duty watertight protection from rain, floods and hurricanes. Since all flood mitigation projects are unique, the ability to customize our products to the specifics of your project gives the customer choices in ease-of-use, reliability and price. 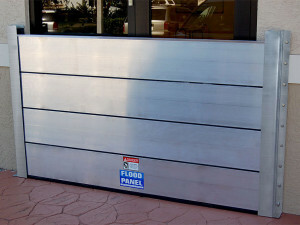 Please visit www.FloodPanel.com for full review. FloodPanel™: Architecture Metals designs, specifies, procures and installs FloodPanel™, an economical and effective flood barrier system. Made of industrial strength metal (aluminum or steel) and compression seals, it protects building's entrances — of any width and height. The interlocking panels are specifically designed for every location, custom built in Florida by our state-of-the-art manufacturer, and installed by our own expert team. 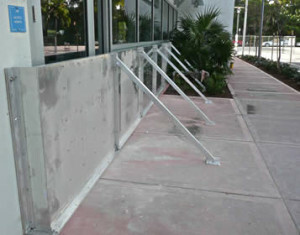 FloodPanel meets FEMA requirements for flood proofing commercial structures. Custom Built Doors: Architecture Metals consults, designs, procures and installs flood doors, flood panels, hinged barriers and self-closing products. We source flood door products from PS Corporation, which has developed and manufactured numerous custom doors since 1974. Because not all flood protection projects are the same, the ability to tailor our products specifically to the needs of the project gives the customer choices, both in price and configuration. Hinged Flood Barrier: Hinged flood barriers are available in partial-height or full-height water protection, as well as single units or pairs. They come in various sizes from small access hatch openings, to pedestrian doors, to roadway closures. Sill assemblies can be flush, raised stop, or recessed sills. Vertical Lift Flood Barriers: VLFBs provide a unique design for highly specialized openings. They allow the owner to flood-proof in areas where conventional swinging, sliding or liftout flood barriers are not the preferred choice or physical obstructions inhibit installation. Pedestrian Flood Door: We carry one of of the most progressive moves in the flood door market today. It is a specially designed "every-day-use" pedestrian door that can handle flooding conditions. Because the floor door is always in place, no one needs to go and close the door when flooding conditions occur, giving you 24/7 flood protection, while still allowing access to your facility on a daily basis. It comes pre-hung on the frame ready to install and can be fitted with standard panic hardware, or utilize an electronic key pad or card reader for accessing the door. Self-Closing Flood Wall: Its unique patented design allows for automatic response to rising waters without any human intervention for placement. An excellent choice for protection needed due to flash flooding. The self-closing floodwall stores itself recessed into the ground. During flooding conditions, it rises into position without any outside support (human, electricity, or other power). Its modular design allows for continuous length installations and various protective heights. The flood wall has a flush sill assembly when in the stored position, allowing for pedestrian or vehicle traffic. Please contact us for specific information for your needs.